In a sauce pan, cook organic chicken thighs, sprinkled with gourmet sea salt (fancy, I know!) in avacado oil (I rarely really measure anything, so just eyeball it!) till cooked they. Once done, set them aside and added asparagus, red onion slices and 2 cloves of minced garlic to the same pan and cook till the onion become tender. 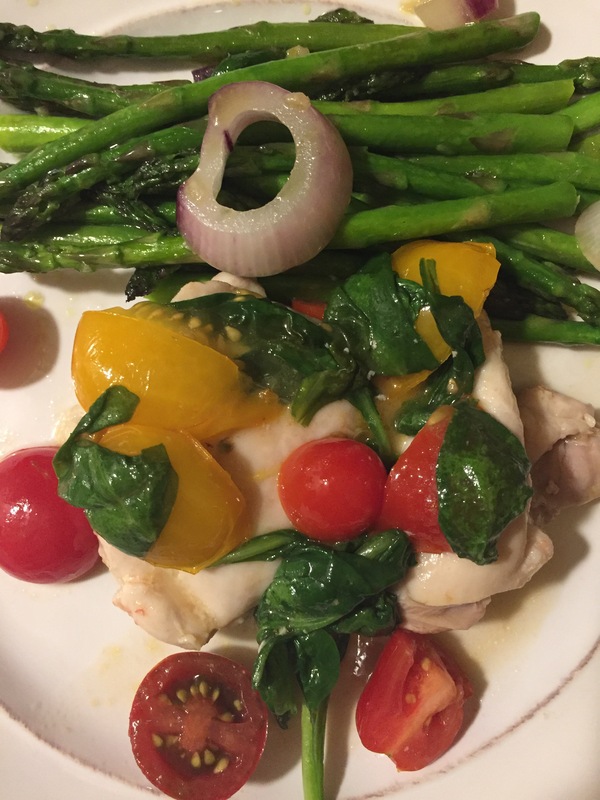 Divide the asparagus mix onto two plates, put the chicken back in the sauce pan to reheat, add the cherry tomatoes and handful of spinach. Top it off by splashing coconut balsamic vinegar on top of the chicken ( we got ours in Stone Harbor at an adorable shop called The Well Dressed Olive, but any balsamic vinegar will do. Heat for just a few minutes, add them to the plates with asparagus and viola! A simple, tasty and healthy dinner! There are so many adaptions you could make to this, but these were the only ingredients I had at home, so I went with it! Let me know if you give it a try! Side note… If you live anywhere near the Jersey Shore, you HAVE to go to The Well Dressed Olive. It is adorable!!! We got some awesome olive oils, vinegars and some fun colored/themed pastas! The employees were awesome and you can taste test every single olive oil and vinegar they have!